Pole saws are indispensable for safely sawing off branches that are beyond your immediate reach. They let you work without having to climb a ladder. 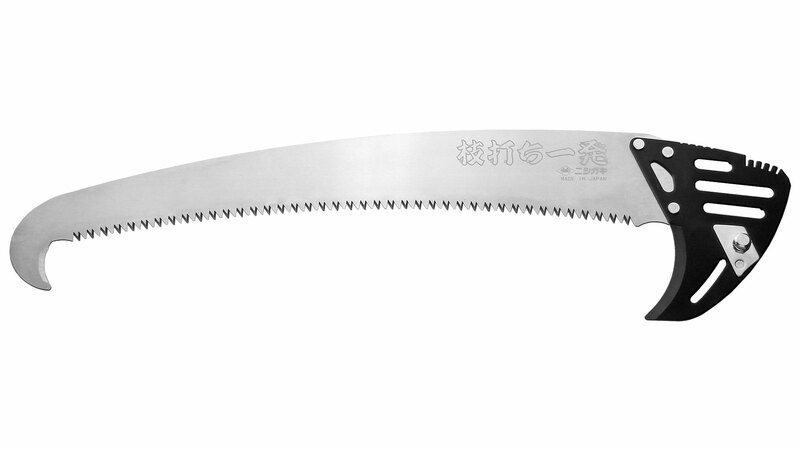 Our pole saws come from the Japanese manufacturer Nishigaki. They have telescopic aluminium poles, so that you can easily extend your natural reach and then collapse the saw to a manageable size for transporting. 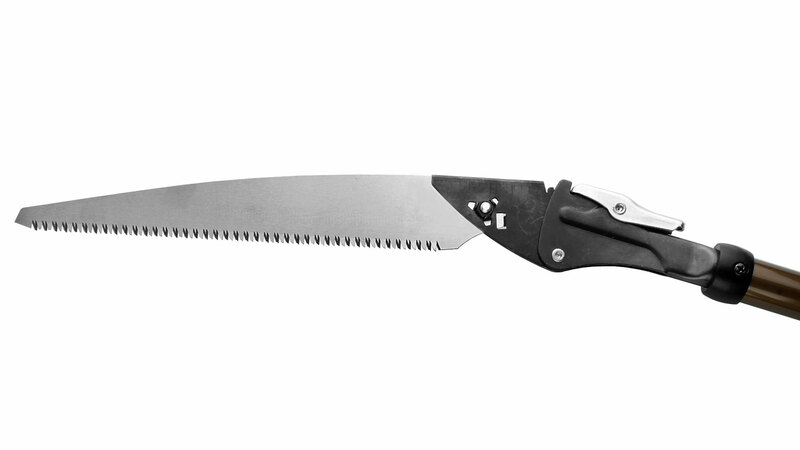 A lightweight series with saw blades 210 and 270 mm long with lightweight aluminium poles. They are primarily intended for the private user, especially people with limited physical strength. To hold and manouvre a saw on a long pole requires substantially more strength than handling a saw at the end of a short pole. This aspect should not be underrated when selecting a pole saw. 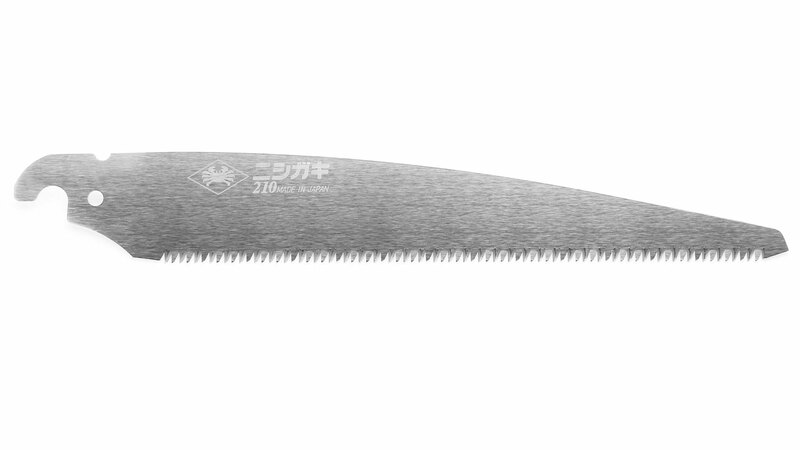 A heavy-duty series with very sturdy aluminium poles and saw blades 390 mm long, each with a hook and bark cutter. These are intended for the professional user. 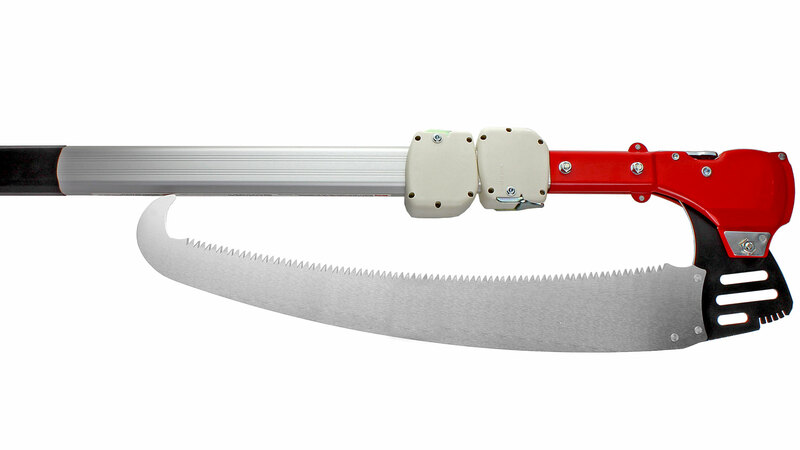 Pole Saws, lightweight Series These pole saws are available in 4 lengths. 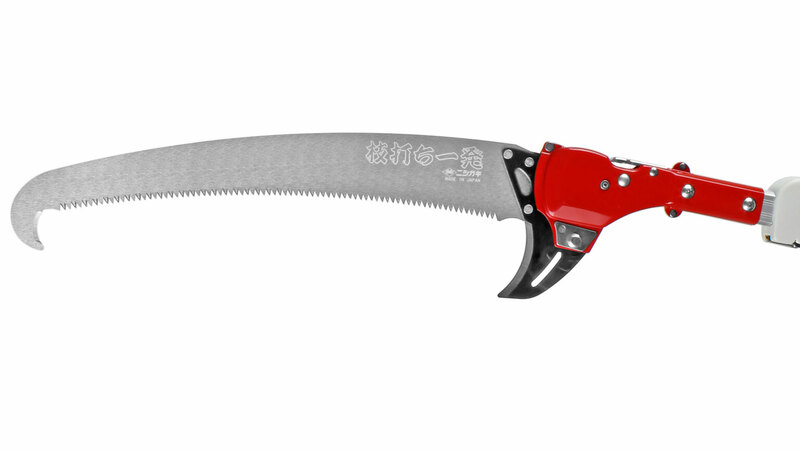 The saw blade can be locked in 4 different positions, so that an optimal working angle can be achieved, depending on the orientation of the branch. To extend or telescope the poles you unlock them by twisting the handle slightly to the left. A twist to the right locks the poles again. The two poles can be locked in any position. Thanks to the soft plastic handle, single-grip for the two smaller saws, dual-grip for the two bigger ones, these saws are comfortable to hold even in cold weather. 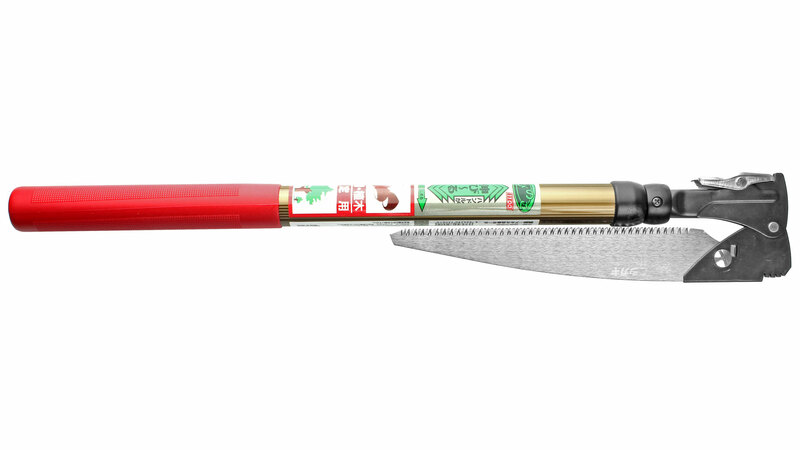 Pole Saws, telescopic, with hook and bark cutter, professional series With a 390 mm long blade plus a hook and bark cutter, these Nishigaki poles saws are up to any pruning job. These pole saws are available in 3 lengths. 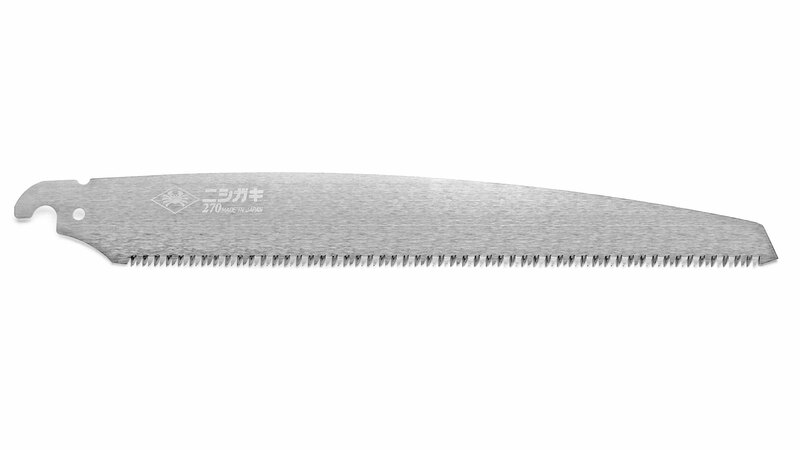 The saw blade can be locked in 5 positions to achieve an optimal working angle, depending on the orientation of the branch (see picture at bottom of page). The extremely stable, three-part aluminium pole is positive-locking every 34 - 67 cm, dependent on size. Pleasant to grip, even in cold weather, thanks to the soft plastic handle casing.